The sun was still playing hide-n-seek with the dark clouds as he stepped on to the terrace. It had been raining heavily all through the day. The clouds, having seemed to have drained their store of cats and dogs appeared to be interested elsewhere. He was disappointed not to find a rainbow. But the brisk and cool breeze sort of made it up for him. He decided to scan the neighborhood as he walked around the damp terrace. The north end was calm as ever. The only difference being that the kitchen-garden of the neighbors next door had pretty much been converted into a kitchen-pond in which their five-year-old was trying to sail his paper boats. Moving over to the west, he saw two little birds on the big mango tree making quite a noise about a worm they had just caught. Obviously arguing about which of them was earlier. The south, however, looked a tad disturbed. It appeared that the dozen odd kids from the four-generation-household, who had finished drenching themselves running after each other in the rain, were now running around trying to escape their mothers who wanted to get them out of their wet clothes. But he stopped as he came to the east-end. As usual, he glanced towards the house down the street. It somehow felt alive within, but motionless as always. The terrace was deserted. He was confused whether to feel relieved or disappointed. So he continued to eye the deserted terrace in order to solve his confusion. And he got his answer the next moment as the door burst open and revealed contents which instantly spread all over. The rucksack of terror that emerged from the door was ‘Gonglu’, the ten year old who was the scourge of the neighborhood. Though he was barely ten, he was built well enough to handle two ten-year-olds. He had heard how Gonglu’s mom was to have twins. But apparently gave up on the trouble of delivering twice and instead had Gonglu. He surely looked like a pair of twins that weren’t given the trouble to separate at all. The quality which kept Gonglu at the top of the weekly charts of the nuisance mongers of the area was his spontaneity. To hatch up an evil plan to render his victims aghast was with him, the work of a moment. And each time his eyes saw Gonglu, he would involuntarily be forced to recall that day when his ‘Rambo’ ran up and down the street at unbelievable speeds as each of the juicy ‘chatai’ bomb tied to its tail blasted louder than the one before. To watch one’s beloved dog run for his life is bad enough. But to watch him run without even being able to tuck his tail in between his legs is worse. And he simply winced on recalling that incident once again. He had hated Gonglu ever since he descended on that peaceful locality with his family for newer prey. And he could have easily dealt him some good lessons if it wasn’t for… Her. Gonglu’s elder sister. He remembered the moment when he first saw her. And how he had simply melted. She had mesmerized him. And that sparkle in her eyes had shot right through him. He always wondered, how could siblings be so infinitely opposites of each other… ?? He scanned the terrace once again. There was no sight of her. But Gonglu seemed to be getting ready to fly a kite. Something that gave him immense pleasure. Though it served as a warning sign for the entire living neighborhood. And suddenly he had an idea. “I’ll show the devil how to fly a kite !” He ran back in and came out with a kite and thread. Gonglu looked around for probable victims, and saw him tugging at his kite. He grinned. When he saw Gonglu grin, he felt his insides churning and something hot rising up his nose, to his head. “Just you wait. You monster !” And he loosened his kite further to get to the right length. The sound of the impact echoed through the length of the street. He wondered if people had ever heard a kite strike a ten-year-old’s head. Maybe they hadn’t. But the sound he heard right then didn’t really seem like it. The sound should probably have been close to a thud. Not the thud of a falling sack-full of potatoes. But a thud of a stick striking a hairy head. But this sounded more like a pair of scissors striking a table head on. And as he shifted his attention to the source of that very sound, he saw Gonglu’s burly Brigadier of a dad pressing hard at his bald head looking around desperately to ascertain the new target for his rifle. In all the excitement to teach the thug a lesson, he had completely missed when Gonglu’s dad had joined him on the terrace. There are a few situations which ask for immediate actions. And this was one such situation. And the best and only possible action he could think of was to duck. And as he ducked, he plucked at the thread in his hand to avoid leaving any ‘loose ends’. He watched through a crack in the wall, still crouching. And he could see the Brigadier stomping his feet off the terrace. While the real target was still at large. He wasn’t going to give up. And soon he had another kite up in the air. He decided not to risk repeating the previous plan and ending up hitting bald and unsuspecting Brigadiers on the head again. “I’ll fight him off in a kite fight !” he said to himself. He tweaked and pulled at the thread, trying to get close to Gonglu’s while he had one eye on the terrace to check if the dad really returned with a loaded rifle. And that was when he lost it. She had just stepped out on to the terrace, looking around skywards. And he felt his heart skip a beat. She had walked up to her kid brother, taking keen interest in the kite flying contest. He was still tugging at the thread, looking at her, when he suddenly felt it get too tensed. And as he looked back bringing his attention to his kite, he couldn’t find it in the air. And it immediately struck to him that his kite had smoothly landed somewhere behind their house while he was busy admiring the cutest girl around. The prospective fight had ended rather abruptly. And he saw Gonglu look back at him and grin. And she looked back too. “Oh God. She’s looking. I’ve got to get out of this one !” he prayed. And he tugged at the thread. 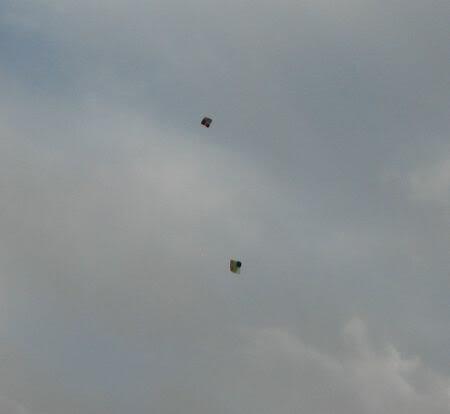 And all of a sudden his kite appeared from behind the roof top. But his joy was short lived as the kite was now in the possession of a red faced descendant of the apes. Panic ! He tugged and tried to pull it out of the monkey’s hands. But one cannot do much but stare when monkeys have some other ideas. And this one had too. It quickly started biting the kite like there was no tomorrow. And with each bite, he could hear the guffaws of Gonglu mixed with those of his sister. All he could manage was stand and stare with his face getting as red as the monkey’s, and starting to feel faint with embarrassment. Gonglu was having fits of laughter. While she had sobered down a bit. He watched silently as she turned to leave. She walked up to the door, and stopped. She turned her head around to face him. Looking at him, she smiled. And then she ran inside. He suddenly noticed, there was a rainbow in the eastern sky now, and he smiled too.